Design efficient machine learning systems that give you more accurate results About This Book * Gain an understanding of the machine learning design process * Optimize machine learning systems for improved accuracy * Understand common programming tools and techniques for machine learning * Develop techniques and strategies for dealing with large amounts of data from a variety of sources * Build models to solve unique tasks Who This Book Is For This book is for data scientists, scientists, or just the curious. To get the most out of this book, you will need to know some linear algebra and some Python, and have a basic knowledge of machine learning concepts. What You Will Learn * Gain an understanding of the machine learning design process * Optimize the error function of your machine learning system * Understand the common programming patterns used in machine learning * Discover optimizing techniques that will help you get the most from your data * Find out how to design models uniquely suited to your task In Detail Machine learning is one of the fastest growing trends in modern computing. It has applications in a wide range of fields, including economics, the natural sciences, web development, and business modeling. In order to harness the power of these systems, it is essential that the practitioner develops a solid understanding of the underlying design principles. There are many reasons why machine learning models may not give accurate results. By looking at these systems from a design perspective, we gain a deeper understanding of the underlying algorithms and the optimisational methods that are available. 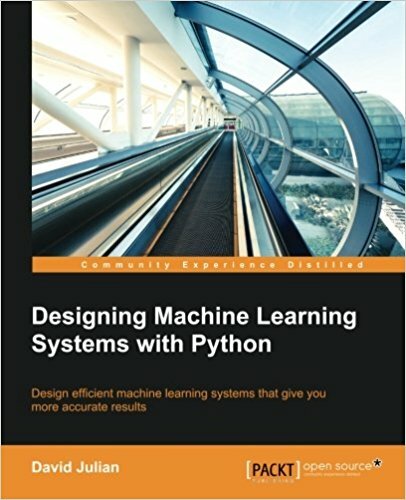 This book will give you a solid foundation in the machine learning design process, and enable you to build customised machine learning models to solve unique problems. You may already know about, or have worked with, some of the off-the-shelf machine learning models for solving common problems such as spam detection or movie classification, but to begin solving more complex problems, it is important to adapt these models to your own specific needs. This book will give you this understanding and more. Style and approach This easy-to-follow, step-by-step guide covers the most important machine learning models and techniques from a design perspective.